In an eye with normal vision, focusing ability of the cornea and lens is matched to the length of the eye. 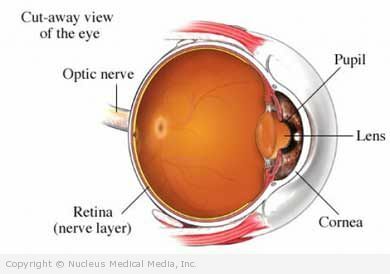 Your eyes are therefore able to focus an image precisely on the retina. In nearsightedness, or myopia, vision is better up close than at a distance. In farsightedness, or hyperopia, vision is often better at a distance than up close (although it may be blurry both at a distance and up close). Both of these conditions are caused by structural distortions within the eye. In myopia, your eyes focus the image ahead of the retina. This usually occurs with an eyeball that is longer or a cornea that is steeper than normal. In hyperopia, your eye focuses the image behind the retina. This usually occurs if your eyeball is too short or the cornea has too little curvature. With aging, the lens of the eye becomes less flexible and cannot focus as well on close objects. This condition, called presbyopia, accounts for the development of difficulty seeing near objects in most people after the age of 40. A risk factor is something that increases your chance of getting a disease or condition. Risk factors are slightly different for the two types of vision disorders. Having a family member with myopia increases your risk for the disorder. Also, although the evidence is conflicting, some specialists believe that chronic near work, such as iprolonged periods of reading or the daily use of a computer can increase the risk of developing myopia. A vision specialist will ask about your symptoms and medical history. You will be given an eye exam and checked to see if prescription lenses will help improve your vision. Laser epithelial keratomileusis (LASEK) — a procedure that is quite similar to LASIK, but differs in a technique of removal of the first layer of cornea. LASEK supposedly offers benefits over the typical LASIK procedure in terms of faster healing time and decreased post-surgical pain. Those benefits have been however questioned by recent studies. More research is needed to clarify the benefits of the LASEK procedure. Epi LASIK procedure (Epithelial laser-assisted in situ keratomileusis) — a hybrid procedure that combines elements of both LASEK and LASIK. Most of the treatments for nearsightedness can be applied to hyperopia as well. Another common treatment is the use of reading glasses or bifocals, which are particularly useful for presbyopia. There are also collagen shrinkage (ie, conductive keratoplasty) techniques. For people undergoing cataract surgery (or refractive lens exchange surgery), intraocular lenses that correct for myopia or hyperopia and presbyopia are now available. There are no guidelines for the prevention of myopia or hyperopia.